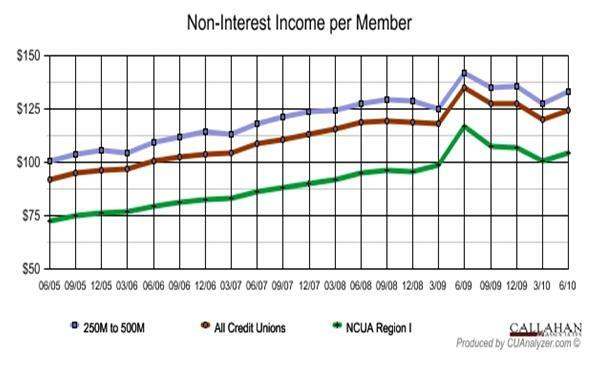 The non-interest income per member ratio helps credit unions measure member participation. The non-interest income per member ratio measures the amount of income generated per member. Generally, higher ratios indicate a higher level of member participation in the credit union. This ratio is a method for measuring how well the credit union has developed non-interest revenue generating products and services. It also measures the members' accepted of these products and services. Non-interest income factors that affect the ratio fall into two major categories — income generated directly from the member in the form of fees and income generated indirectly from members or other aspects of the credit union’s operations, i.e. interchange income from credit and check cards and income from CUSO activity. The member factor is most influenced by the make up of the field of membership. Memberships composed of people with average or below average wealth could drive this ratio down unless an aggressive fee policy was in place and the members were actively using the credit union. A more affluent membership would increase assets, which could also drive the ratio down unless members used non-interest income generating products and services. Strategic factors that affect the ratio include the credit union’s fee philosophy, the marketing and market penetration efforts, and the credit union’s CUSO plans. Related ratios and measures include assets per member, checking account penetration and services per member, single service and dormant account levels, and credit card and check card transaction activity. How Does Callahan's ROM Work? Managing Expenses: The Doom Loop?